August | 2015 | Go Chapel Hill! 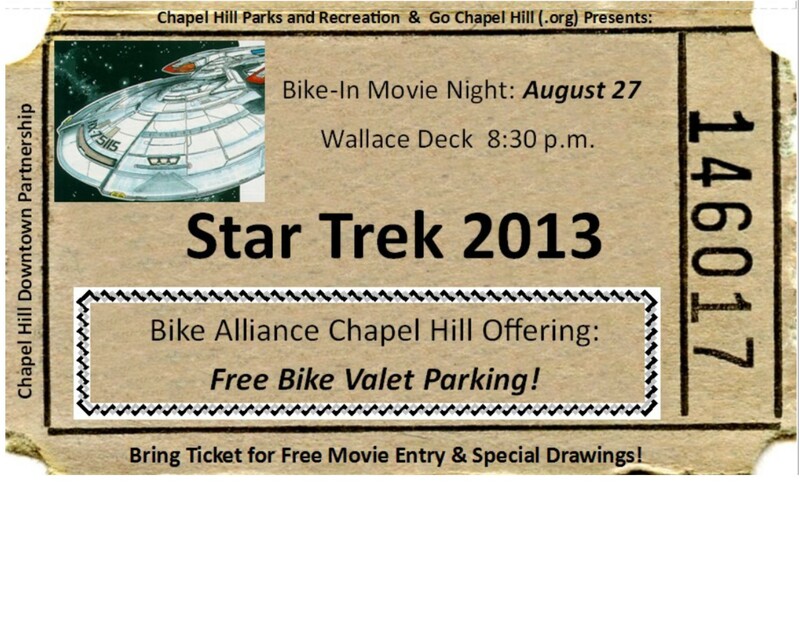 August 27: Bike Valet Parking for the Star Trek Into Darkness FREE Bike-In Movie Night on Wallace Deck in Chapel Hill at 8:30 p.m.
Selfies with the Moon Lit Large Behind You! 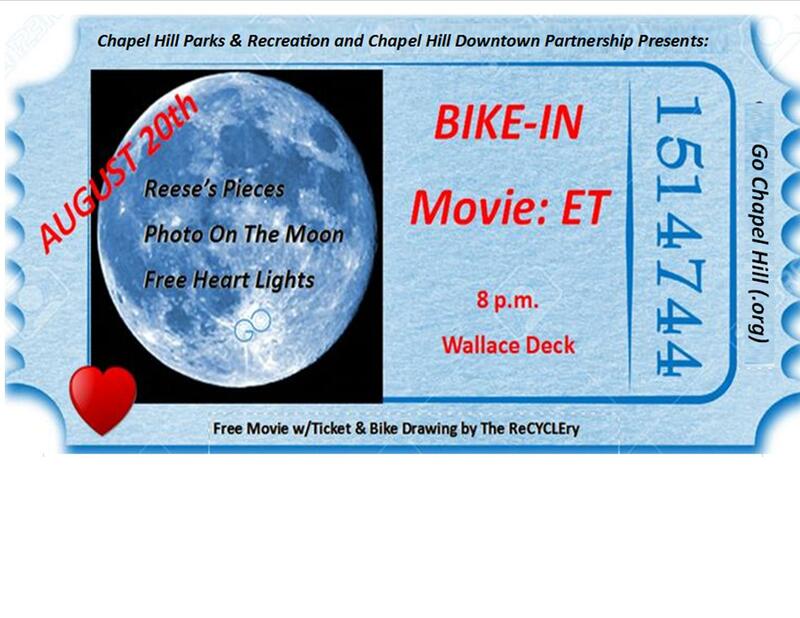 ET PHONE HOME BIKE-IN MOVIE NIGHT AUGUST 20!!! Print this ticket and bring for free entry and possibility of winning a bike!! FREE BIKE-IN MOVIE NIGHT ET (maybe win a bike)!!! • Walk, Bike, Bus to and from work games!!! • Photo flying ET over the Moon on a BIKE!!! Watch ET Ride that Bicycle OVER THE MOON – Talk about alternative transportation!!! Come to the FREE MOVIE and sign up to win a bicycle on August 20th!!! The Town of Chapel Hill’s Go Chapel Hill program received two awards for Excellence in Transportation Demand Management given by the Association for Commuter Transportation (ACT). The Town received the Outstanding Public Sector Award for its efforts in outreach to young professionals and other people who normally walk or bike to work. “Joe the Duck” (pictured) was created to draw attention to safety efforts. Participants were also given a cup of coffee as a thank you for targeted travel behavior. This award recognizes the development and implementation of a product, program, promotion, service, or marketing campaign designed to meet an identified commuter need or concern. Go Chapel Hill also received the Marketing and Outreach Private Sector Award for projects under $5,000 in cost. The ACT Excellence in Transportation Demand Management awards are given annually for innovative concepts, creative solutions, professional achievement and leadership. The Town’s transportation partner, Go Triangle, also received an ACT Award for Marketing and Outreach Public Sector Award Under $5000. Go Chapel Hill promotes alternative transportation in order to reduce traffic, keep the air clean and offer healthier lifestyle for citizens. Promotions include the Town’s Transportation Management Plan program with local business owners as well as through special events while partnering with the University and the Town of Carrboro. For more information visit: www.gochapelhill.org. Chapel Hill is working to make the community safer for travelers. Help us become a safer place to walk, bike and drive. For more information, visit: http://www.townofchapelhill.org/residents/transportation/bicycle-and-pedestrian. A Route: A-Limited morning trips will resume (7:14–9:44 a.m.). These trips operate in a loop between Hillsborough Street, Campus and Martin Luther King Jr. Boulevard and only operate when the University is in session. NU Route: Weekday evening and weekend service will resume. U Route: Weekend service will resume. Safe Rides: Service will resume on Thursday, August 20 and will operate on Thursday, Friday and Saturday evenings when the University is in session. EZ Rider will operate Monday-Friday from 5:00 a.m. to 11:17 p.m., Saturdays from 8:15 a.m. to 11:17 p.m. and Sundays from 10:38 a.m. until 11:17 p.m. (Premium Service will operate on a space-available basis from 11:30 a.m. – 5:30 p.m.). New schedules are available on our website and printed schedules will be available on buses the week of August 10th. NextBus predictions may be impacted by the service changes for the week following August 17th. Please refer to printed and online schedules during this time. Please contact a Customer Service Representative at 919.485.7433 or via email at chtransit@townofchapehill.org with any questions. Nominate Best Commuter You Know Golden Modes Awards Time!!! Every year the regional Go Smart alternative commute program, rewards individuals, employers & organizations committed to promoting sustainable transportation, improving our environment and reducing tra­ffic. As part of the regional Go Smart program, Go Chapel Hill encourages you to take a few minutes to nominate an individual or company to let them know their dedication to smart commuting is appreciated – you can even nominate yourself! Just use the blue links below to visit the short nomination form. Winners will be recognized at the 2014 Golden Modes Award Ceremony in RTP on November13th. Nominations close Tuesday August 18th. ETC Honors – Recognize a workplace coordinator who shows a commitment to smart commuting and takes exemplary efforts to encourage employees to do the same. Nominate a Community Champion Community Impact Honors recognize a volunteer group, community organization, individual advocate, elected official or community event that has made a meaningful contribution to or impact on improving regional transportation options – whether through partnerships, planning, education or awareness. Thank you for your support! We look forward to seeing you in November at the Annual Golden Modes Award Ceremony. Stay tuned for a specific date and location – exciting news is coming! !